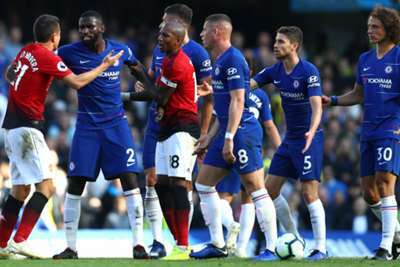 Defender Antonio Rudiger has put the late fracas between Manchester United and Chelsea staff down to emotions after the frantic 2-2 draw at Stamford Bridge. Anthony Martial's double looked to have secured the points for United, but Ross Barkley's goal in the final minute of six added on denied Jose Mourinho a win at his former stomping ground. That sparked ugly scenes on the sidelines, with Mourinho confronting Chelsea assistant Marco Ianni for running past the United bench in celebration, with the players on the pitch soon getting involved in arguments of their own. Mourinho, who was the subject of taunts from the home crowd, then held up three fingers to the Blues faithful after the final whistle – apparently in reference to the three Premier League titles he won during his time as Chelsea boss. However, Rudiger, who scored the Chelsea opener early on, insists that any bad blood ended once the Premier League game was over. "I don't know [what happened]," Rudiger told Sky Sports. "I just saw the benches standing up, and I was like 'what, a fight?'. "But it is emotions, it's just football. I didn't see anything on the pitch. But that's football. "At the end of the day you shake hands. The game was still going on [when it happened]. That's emotion, at least everything has calmed down now." Barkley's equaliser marked a second goal in as many club games for the midfielder, who is in form after a difficult start to life at Stamford Bridge last season. "Yes, my confidence is growing," Barkley, who started twice for England during the international break, told Sky Sports. "Our target was to get the three points, so it's disappointing, but to stick in at the end and get the draw, we showed great attitude at the end. "I'm building momentum game by game. I'm working hard in training and the performances are coming in on game day, but we came in to get the three points."